Rivalries are good: they keep software developers competitive, leapfrogging each other in features. They keep the pressure on, and having seen what happens when one company gets a monopoly (Microsoft Office, I’m looking at you), progress generally slows. 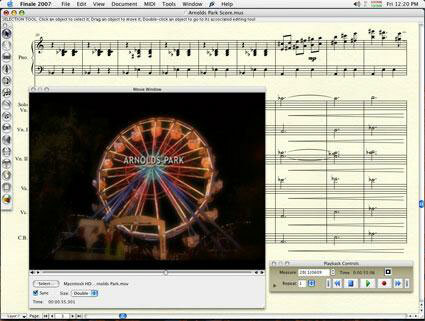 Notation users have benefited from the Finale/Sibelius rivalry, and that competition continues to produce better and better notation software. Finale 2007 looks like it will continue that trend. Sounds familiar, huh? Now, honestly, these were really features that both packages would inevitably add, so I’m glad to see Finale continuing to level the playing field. And don’t get me wrong: there are plenty of other features that are unique to Finale; Finale users will want to read through the extensive feature list Finale just posted. Specifically, they continue to improve integration with Native Instruments Kontakt Player and Human Playback features. Unlike Sibelius, Finale can host a wide range of VST/AU plug-ins (all based on Kontakt); the feature works really well in Finale 2006 and is improved in 2007. But most importantly, I think copying is good, not bad. Many of the Sibelius and Finale users are fiercely loyal to their product; they have to be — composing is hard enough work as it is, and switching from one platform to another would be a big adjustment. I wholeheartedly endorse upgrading each product, with one caveat: back up your system and keep your old version handy. Your scores are too important to risk on any upgrade from any company. Case in point: a bug in the Finale 2006 installer for Mac (later fixed) could wipe out preferences. But, once you’ve backed up, sometimes the latest-and-greatest really can be the greatest. The only real bad news? A few lines in my book are now out of date.